Children today are confronted by a bewildering array of marketing practices. These practices are constantly evolving, increasingly complex, and often subtle in their implementation. Nowhere is the range of marketing phenomena more apparent than in the digital marketplace where children are exposed to marketing through a variety of media including interactive video games, social networking sites, mobile phones, and instant messaging.1 Research on children's ability to understand and cope with marketplace advertising has a long history but that research has focused almost exclusively on children's processing of traditional television advertising.2,3,4 The goal of this paper is to begin to lay out what theory and research on children's development might suggest regarding their ability to negotiate the world of digital marketing. Coming to appreciate the nature of marketing, and learning how to cope effectively with it, are not simple skills that instantaneously emerge at some well defined point in children's development. Rather, a whole set of specific competencies needs to be acquired and slowly consolidated. Moreover, these competencies follow their own developmental timetables, timetables that likely differ in non-trivial ways across children and across cultural contexts. A stronger criterion is having the ability to appreciate the purposes underlying marketing. These purposes are complex and multifaceted, typically reflecting a set of hierarchically embedded intentions on the part of the marketer. The overarching intention is to induce consumers ultimately to buy a product (selling intent). To carry out this intention the marketer engages in some form of implicit or explicit persuasion. Persuasive intentions have the goal of changing others' mental states and are typically aimed at generating beliefs about the desirability of a product. Other types of intention may be nested within a marketer's intent to persuade. For example, there may be informative intentions in which the marketer aims to let consumers know about the important features of the product. In addition, however, persuasion also typically reflects the self-interest of the marketer who may portray a biased view of the product. Some form of promotional intent is thus almost always present in marketing. Promotional intent may or may not be accompanied by explicit deceptive intent or manipulative intent. At the very least, however, it opens up the possibility that children will be misled by marketing. Of course, children might have some recognition of the intentions behind marketing, and yet still fall prey to its ill effects. For example, they might forget to make use of their knowledge; they might fail to detect or to attend sufficiently to marketing bias; or having fully recognized that bias, they might nonetheless be poor at retaining that knowledge, or at using it to control subsequent thought or behavior. Having generic conceptual knowledge, determining how that knowledge applies in specific instances, and translating knowledge into action (or inaction) are, in principle, quite distinct capacities. What does research reveal about children's ability to cope with marketing? Recent theoretical and empirical advances in two areas are especially relevant: the development of children's theory of mind and the development of their executive functioning skills. Important changes in children's theories of mind continue to occur beyond the preschool period. Between the ages of five and seven, for example, children begin to develop an understanding of so called second-order mental states.10 They come to understand that mental states may be embedded within other mental states (e.g., recognizing that others may have beliefs not just about the world but about others' beliefs as well). An arguably more fundamental development involves a shift from seeing the mind as a relatively passive container of information to viewing it as an active assimilator of information.11 This shift begins around the ages of five to seven and continues through adolescence and into adulthood. As part of the shift, children come to see the meaning of informational input, not as something awaiting "discovery" in some observerneutral reality, but rather as imposed by the mind as part of a process of active construal. Consequently, they begin to recognize the influence on people's thinking of preference, bias, prejudice, and other aspects of subjectivity. These developments carry with them an appreciation of interpretive diversity wherein children recognize that different individuals might construe the meaning of an event in fundamentally different ways. The following predictions concerning children's persuasion knowledge can be generated from the theory of mind literature.12 There is little reason to suppose that even very young preschoolers could not discriminate between marketing and non-marketing content, at least as portrayed in traditional television advertising and programming. What is more critical, however, is whether that discrimination rests on an understanding of marketing intentions. Under optimal circumstances, children should be capable of recognizing the overarching purpose of marketing (the marketer wants to sell a product) by three years of age. At this age children should also understand simple persuasive intent aimed at directly influencing behavior (the marketer is trying to get me to buy the product). Somewhere between three and five years of age, children should begin to recognize both informative and deceptive intent (the marketer is providing information about the product, some of which may be misleading). By four to six years of age an appreciation of persuasion aimed at influencing mental states may begin to emerge (the marketer is trying to change my desires and beliefs about the product). Finally, an understanding of bias and promotional intent may not emerge until children are six to eight years of age (the marketer wishes to promote the product and so is providing biased information about it). To be very clear, these predictions concern the earliest ages at which conceptions of different facets of marketing might be seen under ideal circumstances. That is, children might show these understandings when viewing very simple, "child-friendly" advertisements involving multiple, explicit cues to marketers' intentions. In the real world, however, marketing directed at children is often complex, and marketers' intentions may be anything but obvious (and, as indicated below, this is especially the case for digital marketing). In these circumstances considerably older children (and adults) may show little understanding of marketing and little ability to cope with it.12 These failures, however, are unlikely to be conceptual , because by seven or eight years of age children likely already possess the requisite concepts. Rather, the failures more likely reflect difficulties in deploying conceptual knowledge in order to process and defend against marketing. Developing an accurate conception of marketing is a crucial step along the way to being inoculated against its potentially adverse effects. It is, however, anything but a sufficient condition for being protected from these effects. Clearly, adults often fall prey to misleading advertising, even though they may know full well that marketers present a biased portrayal of products. There is every reason to think that children will be even more susceptible in this regard. Executive Functioning. The important theoretical distinction here is between competence and performance. An individual may possess all of the relevant concepts in a given domain (i.e., be conceptually competent), and yet fail to apply those concepts in performing tasks in everyday settings. The development of executive functioning is especially critical in this regard. Executive functioning involves children's ability to monitor and control their own thoughts, emotions, and actions.13 The executive functions include such skills as inhibitory control and resistance to interference, attentional flexibility, working memory, planning, and impulse control. Immature executive skills may leave children vulnerable in a number of ways. They may be perceptually seduced by salient and pleasing, but largely irrelevant, audiovisual effects in marketing (inhibitory control and resistance to interference); once captured in this way, they may have difficulty switching attention to more relevant, but often less salient, features of the marketing interaction such as product quality, price, disclaimers, and persuasive intent (attentional flexibility); information may come at them so quickly and through so many channels at once, that they may have difficulty holding it all in mind (working memory); and finally, even if they have processed a marketing episode effectively and know full well that claims about a product are likely to be inflated, on entering the marketplace they may nonetheless purchase the product against their better judgment (impulse control). The distinction between conceptual competence and flexible deployment of that competence is important when considering traditional forms of marketing. However, when assessing children's processing of digital marketing, as well as the implications of digital marketing practices for public policy, it becomes absolutely central. A host of factors suggests that children's fledgling conceptual abilities and reasoning skills will be severely taxed by many forms of digital marketing. These factors impinge both on the likelihood that children will access their conceptual knowledge and their ability to make use of that knowledge when it is accessed. First, whereas traditional television marketing is relatively well demarcated from program content, that is typically not the case with digital marketing where the distinction between marketing and content is often blurry and sometimes not present at all. Related to that, the existence of a marketing sponsor may be especially difficult to discern in digital marketing where the attempt to influence individuals' thinking and behavior is often only implicit. It is likely that, in the absence of considerable experience, children may not even perceive that they are involved in a marketing interaction, and so may not see the need to access their marketplace knowledge and skills. In these circumstances they will not be on guard against marketing bias and their product relevant reasoning and decision making will be hampered. Second, in some forms of digital marketing, the marketing attempt is ostensibly not the primary focus, at least from the child's point of view. For example, in so called "advergames"16 , participation in an online game is primary and the marketing appears only incidentally, presented in the background. Children's attention may be largely engaged with the interactive experience and the marketing attempt may be processed only peripherally, and thereby less deeply. Third, even when children are motivated to infer marketing intentions, it may be extraordinarily difficult to discern what those specific intentions are. For example, there may be no overt persuasive intent present at all. That is, the marketer may not be presenting informational arguments in favor of a product but may instead be relying entirely on symbolic associations, or mere repeated exposure to a brand logo. The likelihood that children will successfully make use of their persuasion knowledge in these circumstances will thus be reduced. Fourth, even when children recognize that they are the target of marketing influence, they may nonetheless have difficulty defending against what may be quite powerful marketing tactics. Unlike much of traditional advertising, digital marketing environments tend to be interactive, immersive, alluring, engaging, and motivationally and emotionally rewarding. They also offer the opportunity for individuals to "play" with products for extended periods of time.16 Moreover, marketers continue to enhance these characteristics as the capacity grows to tailor marketing to specific demographics and specific individuals. In such circumstances, children with weak inhibitory and attentional resources may have great difficulty resisting marketing influence even with much of the requisite marketplace knowledge in hand. Indeed, a recent study suggests that children's persuasion knowledge does not necessarily play a protective role at all.17 In this study preference for a specific food brand was not associated with understanding of persuasive intent. Even though children recognized such intent, and even though they did not believe the claims of the marketer, they nonetheless preferred the marketed brand over competing brands. Fifth, children's ability to control their behavioral impulses is likely to be pushed to the limit in the context of digital marketing where the point of influence is often much closer to the point of purchase. In particular, the opportunity to purchase products online in the midst of a marketing interaction leaves little opportunity for seductive marketing messages to recede into the background where they might be processed in a more balanced manner. Children's impulsivity leaves them similarly vulnerable as marketers further develop the ability to use mobile media to target individuals close to the physical location at which products are sold. Finally, digital marketing takes many forms and is implemented on a wide variety of media platforms. Children will have widely varying experiences with each of these forms and platforms. Experience with particular forms of marketing is likely to have a protective effect on children's ability to cope with advertising. However, it is far from clear that experience with one marketing medium will transfer quickly, let alone automatically, to another medium. Acquiring expertise in processing digital marketing is therefore likely to be an uneven and lengthy process. Research on children's processing of marketing messages has traditionally focused on television advertising, targeting especially children's appreciation of persuasive intent in that context. Certainly, it is important to establish when children acquire understanding of that kind. However, this should not be the only criterion for public policy decisions concerning the age at which children might need protection from marketing, and this is especially so when considering the complexities of digital marketing. More appropriate criteria should be derived from an assessment of how well-entrenched children's marketing concepts are, the conditions under which they can flexibly access and deploy these concepts, and the extent to which their subsequent behavior is guided by these concepts. Merely having the concepts in some latent form may do little if anything to prevent children from being led astray by marketing influence. Programmatic research on children's processing of digital marketing is sorely needed but is only now beginning. A full accounting of the impact of digital marketing on children's lives must await the outcome of that research. Nonetheless, an abundance of research on children's cognitive development, and specifically on their slowly developing executive skills, strongly suggests that children will need protection from, as well as education with respect to digital marketing practices. 1. Chester, J. & Montgomery, K. (2007). Interactive food and beverage marketing: Targeting children and youth in the digital age. Berkeley Media Studies Group. 2. Boush, D.M., Friestad, M., & Wright, P. (2009). Deception in the Marketplace: The Psychology of Deceptive Persuasion and Consumer Self Protection . New York, NY: Routledge. 3. Gunter, B., Oates, C., & Blades, M. (2005). Advertising to Children on TV: Content, Impact, and Regulation. Mahwah, N.J.: Erlbaum. 4. Kunkel, D., Wilcox, B.L., Cantor, J., Palmer, E., Linn, S. & Dowrick, P. (2004). Report of the APA task force on advertising and children. American Psychological Association. 5. Harris, P. L. (2006). Social Cognition. In D. Kuhn & R. S. Siegler (Vol. Eds. 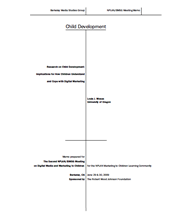 ), Handbook of Child Development Vol. 2: Cognition, Perception and Language (pp. 811-858). Hoboken, N.J.: John Wiley & Sons. 6. Malle, B.F. & Hodges, S.D. (Eds.) (2006), Other Minds: How Humans Bridge the Divide between Self and Other. New York: Guilford Press. 7. Wellman, H.M., Cross, D., & Watson, J. (2001). Meta-analysis of theory-of-mind development: the truth about false belief. Child Development, 72, 655-684. 8. Perner, J. (1991), Understanding the Representational Mind . Cambridge, MA: MIT Press. 9. Wellman, H.M. (1990), The Child's Theory of Mind . Cambridge, MA: MIT Press. 10. Perner, J. & Wimmer, H. (1985). "John thinks that Mary thinks that ...": attribution of second-order beliefs by 5- to 10-year old children. Journal of Experimental Child Psychology , 39 , 437-471. 11. Chandler, M.J. & Sokol, B.W. (1999). Representation once removed: children's developing conceptions of representational life. In I.E. Sigel (Ed. ), Development of Mental Representation: Theories and Applications (pp. 201-230). Mahwah, NJ: Erlbaum. 12. Moses, L.J. & Baldwin D.A. (2005). What can the study of cognitive development reveal about children's ability to appreciate and cope with advertising? Journal of Public Policy and Marketing, 24, 186-201. 13. Zelazo, P.D. & Mller, U. (2002). Executive functions in typical and atypical development. In U. Goswami (Ed. ), Handbook of Childhood Cognitive Development (pp. 445-469). Oxford: Blackwell. 14. Diamond, A. (2002). Normal development of prefrontal cortex from birth to young adulthood: cognitive functions, anatomy, and biochemistry. In D. T. Stuss and R. T. Knight (Eds. ), Principles of Frontal Lobe Function, New York, NY: Oxford University Press. 15. Garon, N., Bryson, S.E., & Smith, I.M. (2008). Executive function in preschoolers: a review using an integrative framework. Psychological Bulletin , 134 , 31-60. 16. Lee, M., Choi, Y., Quilliam, E., & Cole. (2009). Playing with food: Content analysis of food advergames. Journal of Consumer Affairs, 43, 129-154. 17. Mallinckrodt, V. & Mizerski, D. (2007). The effects of playing an advergame on young children's perceptions, preferences, and requests. Journal of Advertising, 36, 87-100.